Vivian Amis was born in Wiesbaden, Germany on January 23, 1961. Vivian comes from a large family of 10 and grew up most of her life living in Hamburg, Germany. In 1994, she moved after the divorce from her second husband to America with her three children. In 1997, she met her third husband and had with him her fourth child. I have always felt a very strong connection to God, even when I was small. Around the age of 8, I remember being aware that I was not the person "Vivian" and asked myself: Why am I looking through these eyes? Mystical experiences put me on my spiritual path. I read many books on esoteric, new age and metaphysical nature but none gave me the answer I was seeking. The question I was seeking answer to was: What is the Truth? I did not know about a big Truth...I just wanted the truth. One day in 2003, while contemplating on God and where God is...I heard a voice saying: I am closer than you think. My first reaction was: of course you are...everyone knows that. But there was a silence...like when someone makes a statement and is waiting for a reply. So I thought about it. Closer than you think...thinking...thought. Closer than thought...before thought and I realized my true Self there. BUT….even after finding my Self…I did not feel bliss. It was like I knew who I am. I am pure beingness before anything came into being….but I needed more. Shortly thereafter, one day while lying down to meditate…I had enough. I wanted to know the Truth and was ready to surrender completely. I was ready to give up and let go…I mean completely. I thought about the things I loved and handed then over to God. I thought about all the things I had learned, experienced and had an opinion on….and handed them over to God and I thought about my very life and handed it over to God. I felt completely empty and thought I was going to die. That evening I fell asleep with a feeling of a question and woke up the next morning in bliss. Complete bliss. There was only bliss and bliss took up all space and never left me. I remember my pool being covered for days with the most beautiful butterflies, even after removing them all each day". Vivian is the author of " The Lotus - Realization of Oneness", "I AM - The Key to Manifesting", "The Essentials of Life" and three children books: "The Light within you", "One Big Shine" and "Namaste". 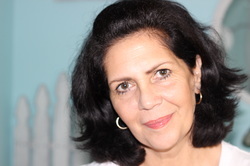 Vivian has written many articles and quotes on spirituality/self help. Her articles have appeared in Spiritualnow, Wholistic Healing Research, Ezine Articles, New Times Naturally, Natural Awakening, Expressions of the Soul, Spiritual Living 360, and in Transformation. She lives with her husband, four children between the ages 34 and 14, and two grandchildren in Tampa Florida.